Had Its World Premiere on October 7th & October 9th at UCLA; December 3rd & December 4th in NYC; and January 27th as a Guest Production on the Santa Monica Playhouse Main Stage. and All Your Kind Words About the Play! In a Santa Monica coffee shop, a struggling actor with depression and no confidence strikes up a conversation with a stranger–an assignment by his therapist. The stranger turns out to be an aspiring TV writer who is going through a depressed time herself and just happens to be writing the reunion episode for the beloved TV show Friends as a fun side project. As the two begin their road to getting to know each other (without the help of social media, apps, or phones) they find connection and healing through the beloved sitcom and soon discover that six “Friends” (Chandler, Monica, Ross, Rachel, Joey, and Phoebe) can change their lives. The play runs approximately 1 hour and 35 minutes with no intermission. This project is part of our center’s Narratives Project, which explores the effective use of patient narratives, media and creative arts to stimulate support, sharing and reflection to increase coping and compassion for mental illness. “The One With Friends” play will explore how the arts (TV, theatre, film) can help promote healing and help de-stigmatize depression when accurately portrayed. For this, the audience will be given the option to participate in a short anonymous survey to complete before and after the play to help us measure how the arts helps promote healing and to also measure depression stigma. Click Here for More Information Regarding the Research Study and to View the Details About Your Participation in the Study. If You or Someone You Know is in Crisis, call the toll-free National Suicide Prevention Lifeline at 1-800-273-TALK (8255), 24 hours a day, 7 days a week. The service is available to everyone. The deaf and hard of hearing can contact the Lifeline via TTY at 1-800-799-4889. All calls are confidential. Joseph Mango earned his MFA at NYU’s Tisch School of the Arts in 2014 where he received a full Department Fellowship to attend. At NYU, he received the 2014 Dramatic Writing Chair’s Award and a 2014 NYU President’s Service Award. 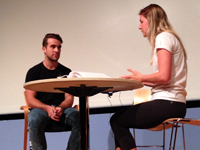 One of his screenplays, James Dean America, won the 2014 NYU Dramatic Writing Screenplay Showcase and was a semi-finalist in the 2015 Final Draft Big Break Screenwriting Contest. He wrote the first draft of The One With Friends at NYU in a class taught by Pulitzer Prize and Obie Award winning playwright Annie Baker (The Flick, Circle Mirror Transformation, John). Joseph received his BA in American Studies/English from the University of Southern California where one of his TV production courses was co-taught by veteran TV director Peter Bonerz (who directed multiple episodes of Friends). Joseph worked as a film production assistant and video playback production coordinator (Ugly Betty, Dirt, Monk, The Riches, Life). He currently works at the UCLA Center for Health Services and Society where he co-leads the Narratives Project with Dr. Bowen Chung and is the project coordinator for the Technology/Communications Core for the UCLA Center of Excellence for Behavioral Health. Outside of work, Joseph is a film enthusiast as well as a pizza and pancake connoisseur (unofficially). Ashley Griggs grew up in Herndon, VA and earned her BA in Film Studies and French at the College of William &amp; Mary in Williamsburg, VA. During her junior year of college, Ashley interned at the Cannes Film Festival, a thrilling experience that solidified her dream of creating unique and meaningful stories that have the potential to bring people together from all corners of the world. Ashley later received her MFA at NYU’s Tisch School of the Arts in 2014 where she was awarded a Future Screenwriters Fellowship and was a finalist in the NYU Graduate Screenplay Showcase. At NYU, she studied theatre under Pulitzer Prize winning playwright and MacArthur Genius Fellow Suzan-Lori Parks and studied playwriting under Pulitzer Prize and Obie award winning playwright Annie Baker. 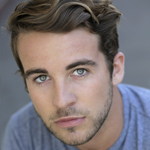 Nick McLoughlin is a Kiwi who has moved out here to pursue his talent and love for all things acting related. He has devoted the past two years to honing his craft at the American Academy of Dramatic Arts however now that he is a graduate and with several lead roles in various short films under his belt, he will be seeking representation looking to make his mark on the business he was born for. Miranda Wynne is extremely grateful to be performing with such an amazing team right here in Los Angeles where she was born and raised. After graduating from UC San Diego with her Bachelors in Theatre and Communications, she has been pursuing film and television while performing in theaters such as the La Jolla Playhouse, Art Share LA, The Whitmore-Lindley and Theaterlab in New York City. She is overjoyed to be working on such an important relatable piece of theatre. She would like to thank her family and friends for the constant stream of support. Proud member of the Firm LA Model and Talent! Chloé Hung is an actor, writer, and director, and is delighted to be a part of The One With Friends. Her stage roles include Romeo and Juliet, Faith Healer, 4.48 Psychosis, The Girl in the Goldfish Bowl, and Happily Whatever After. On screen, she was last seen in Drawing Duncan Palmer. Born and raised in Toronto, Chloé recently graduated from NYU Tisch School of the Arts with an MFA in Dramatic Writing. Her plays and screenplays have been workshopped with NYU, The Kennedy Center, Tarragon Theatre, and The Black List. Her plays have been performed in multiple festivals to rave reviews and enjoyed readings in New York, Toronto, and Washington D.C. Chloé is thrilled to be diving back into acting after a hiatus and would like to thank Joe and Ashley for help her do so. Lindsey Moore Ford has been performing professionally since she was 9. She grew up in Atlanta doing shows at the Alliance Theatre under the direction of such accomplished directors as Kenny Leon. Lindsey graduated from Yale where she was in numerous theatrical productions including She Loves Me and Bat Boy. While at Yale she also performed internationally with her collegiate singing group Shades. Since making the big move west to LA she’s been in several web series, the most recent of which being Kristen Does Her Best. She can currently be seen across the country in Story Pirates productions and in Macbeth In Rhythm! Look out for her one-woman show, Letters to the Boys I’ve Never Kissed. Lindsey is delighted and grateful to be a part of this production of The One With Friends. "Imagine all the possibilities in the world if everyone just...looked up."